Memorials: May be made to a charity of your choice. 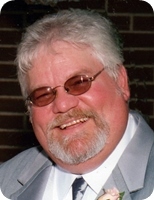 Clifford “Cliff” Rickabough, aged 69, of Grand Rapids, passed away in his sleep on Friday, April 20, 2018. Cliff served in the US Army. He was preceded in death by his parents, Wallace and Bessie Rickabough. He will be lovingly remembered by his wife, Gayle; children, Michele (Dirk) Boeske, Greg (Jennifer) Rickabough; grandchildren, DJ, Tyler, Brandon, Emily; sisters, Nancy Hill, Norma Rickabough, Janet Buschini, Sue (John) Katerberg; and many nieces and nephews. Funeral Services will be held 11:00 am Tuesday, April 24, 2018 at the Stroo Funeral Home. Interment in Blain Cemetery. Contributions in memory of Cliff may be made to a charity of your choice. The family will greet visitors on Monday from 6 to 9 pm at Stroo Funeral Home. Gayle, I'm so sorry to hear of Cliff's passing. My prayers are with you and many hugs.